After the Deadline for Firefox 1.1 is now live on addons.mozilla.org. After the Deadline for Firefox lets you check your spelling, style, and grammar where ever you are on the web. Thanks for integrating LanguageTool! Does this mean that all errors for German and French now come from LanguageTool or does AtD add those to the errors it detects itself? One small suggestion: maybe there could be another way to access the settings dialog, it took me quite some time to find it (although it is in the right place, other add-ons also seem to integrate their settings into the menu). 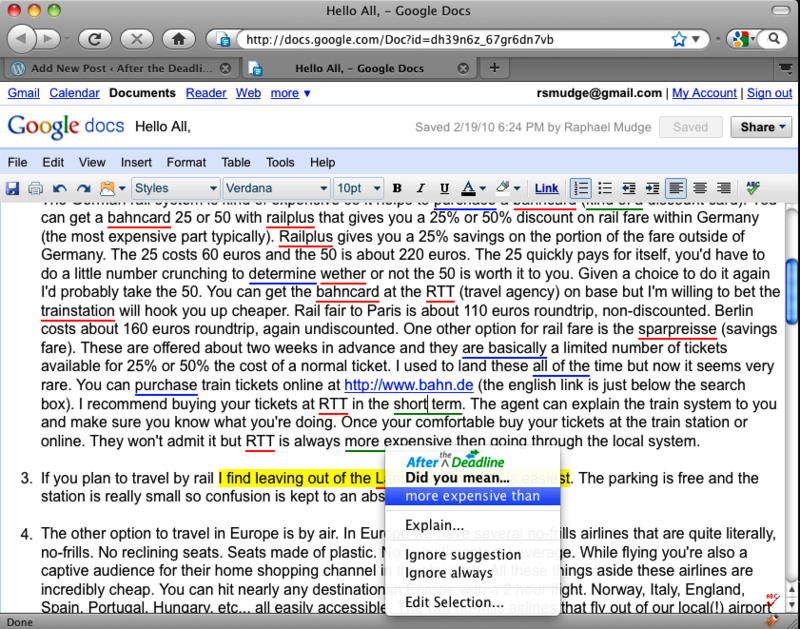 All the errors for German and French AtD come from Language Tool. I’m using AtD’s bigram model to provide a statistical sanity check against the suggestions it reports. 🙂 I may filter errors that have no suggestions (e.g., SV and something Nominal in French). If you are using LanguageTool then will you add proofreading for Polish at future? We’re using Language Tool to offer grammar checking for languages AtD supports. Language Tool is a great product but it is not the driver of which languages we support. We still have to create a working spell checker (and potentially a misused word detector) using our statistical methods. Deciding which languages to support depends on two things: 1) how many WordPress users use that language? and 2) is our technology capable of supporting the language? This includes our front-end components segmenting words correctly so the right stuff gets highlighted as errors. That said, Polish is likely in the future. We have already trained a spell checker for it.